To you who comes here often to check if I have a new entry, big hug! Thank you for not getting tired of me, for sticking around despite my sweet shortcomings. Do you know how many times I have been on hiatus? I've lost count, really. I sometimes wonder if there's a cure to this — this some kind of a disease that enveloped me these past few weeks. No, I'm not sick or anything. I just got really, really lazy to even go to my Blogger dashboard and check the pending comments. I actually wanted to quit. MARTINE. It is true when my blog and writing mentor, Martine, said that our blogs must be connected to how we live our lives. OK. A little honesty here — I've gone through a crisis. Let's say, life slapped me with a harsh reality. So instead of just sulking in sorrow, I tried to solve the problem. The solution had something to do with a start of a new beginning and that new beginning includes an end. Did you get it? You see the connection between that and this? Whatever it is that you're thinking of right now, let it be. What's important is, I'm back. I.am.so.freakin'.back. How will I not be inspired to go back to my cyber kingdom and bleed words again? See ladies, Martine gave me a Ree Drummond book! *virtual chest pop a la Maja Salvador lol* Wow, just wow. I felt like I'm on chocolate dextrose when I opened the package last Thursday. The Pioneer Woman is one of my favorite kitchen goddesses since I started my blogging journey two years ago, and to have her book is like cooking her food in Oklahoma, without smelling the manure-infested air. M said she hopes that the book can cheer me up. It did! In fact, it made me write a pseudo-speech on Instagram. Heehee. Then I mentally planned for my blog, my business and my daughter's gradeschool year next year. I felt like I was in a black and white movie gone colored. Again, from the bottom of my pink, sparkly heart, thank you for continuously inspiring me to become a better blogger, writer and mompreneur. CELINE. 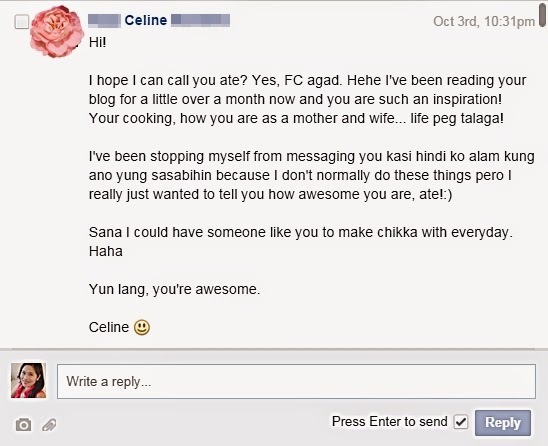 I was watching About Time last night when my phone notified that I received a message on my Bebengisms Facebook page. It was from a reader. Surprisingly, an unmarried single lady. She's 22, not a mom, not married and she reads my blog! Hooray! So I thought only moms with preschoolers and below are the only ones who waste their time here. This proved that I can charm the young ones to read my extraordinarily ordinary story. Well, it kind of pressured me to not make a mistake as this young adult (and others if there are) is looking up to me. But hey, she likes my honesty, she thinks I'm fun so I'm not gonna change gears and try to sound my life is perfect. I'll just be who I am and continue to do what I do. You made me feel like a rockstar, girl. Cheers! I haven't commented here yet! D, I'm so glad you're OK. You had me worried, but I know you are a fighter and a believer, and on top of that, a true GODDESS. You are an overcomer, and I will always believe in YOU. Hugs! See you soon! And your cupcakes!